3. Print wish list (We suggest up to 10 dresses on wish list). You can also print out additional styles via your phone (in-store computers are also available). The day of your planned visit to Peaches Boutique, we recommend you pre-register*. 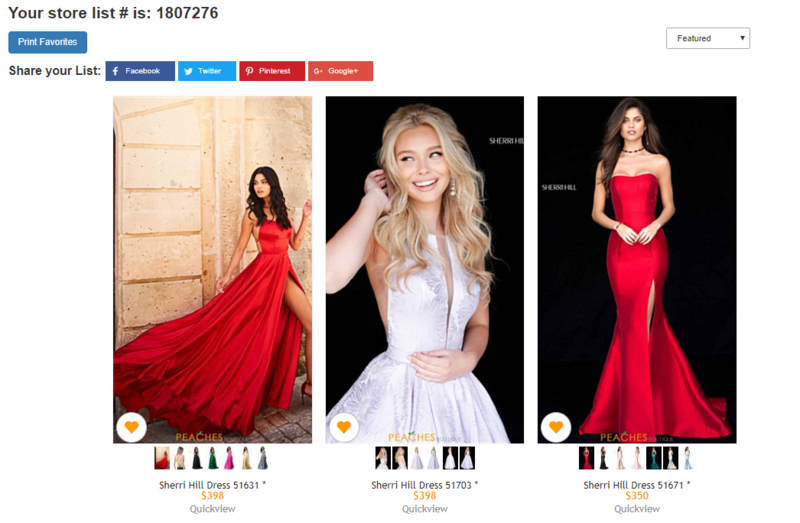 This specifies the type of event you are attending, and we use this record to ensure that we do not sell the same dress (in the same color) to the same event of another shopper. *You have to re-register each time you shop at Peaches Boutique. 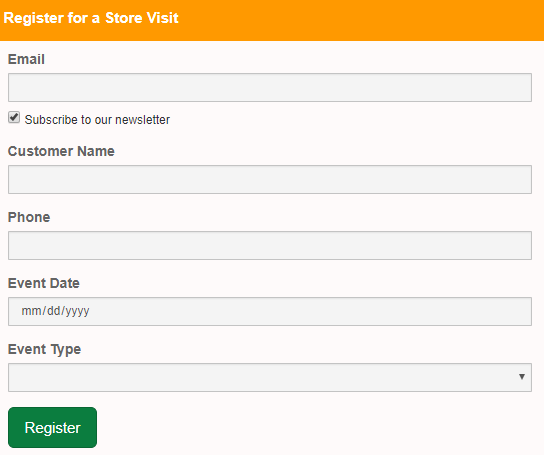 You can also register at the store. You got your wish list and pre-registered. Now what? 1. Arrive early. We operate on a first come, first serve basis. No appointments are needed except for bridesmaids and damas. 2. When you walk into the the store you will be greeted by an associate who will give you a fitting room number and explain the store policy. Although you may have a wish list, we still want customers to select three dresses from the floor to try on. Don't worry if they are not your size or color--the idea is to give your Sales Associate an idea of your style preferences. From there, we can look for your wish list items so you can try them on as well. *You need to have three dresses picked before you can get into dressing room. 3. Once you have selected your three dresses, you can register at one of the computers in the store if you have not already done so prior to coming in. 4. If you have pictures of the dresses on your phone you want to try on, go to the print picture counter and we will print them for you to give to your sales associate when in the fitting room, we need the printed list because we cannot take your phone in the back warehouse. 5. Once a dressing room is available, we will call #'s in the order customers are ready. You will then get a one on one personal sale associate at that time to work with you to help you find your dream dress. ~ Please keep in mind, there are designated areas for cell phone/electronics use, on the floor and by the fitting rooms, there are to be no use of electronics. There are no pictures allowed at all. We also do not allow food or drinks in the store nor strollers. We appreciate your cooperation and understanding. Peaches Boutique is located in a strip mall with many other stores. Unfortunately parking is very limited. Parking in any of the 15 minute parking spots, the laundromat across the street, Walgreens, or the Payless Shoe Source parking lot across the street is NOT recommended as cars can be towed. There is additional Peaches Parking across the street at 5928 S. Archer Ave and the Shop and Save parking lot. Additional Parking available at midway ez parking. Additional Parking also available at Shop and Save parking lot.